What Are Genetically Engineered Foods? Are They Different From Organic Foods? Genetically engineered foods,” also known as genetically modified organisms (GMOs) or bioengineered foods, are those whose DNA makeup has been changed in a laboratory setting, in order to introduce desirable characteristics in the new product. Organic foods are derived from farms that do not use man-made fertilizers, pesticides, growth enhancers or regulators, synthetic food additives to livestock feed, and industrial solvents or radiation. “Genetically engineered foods,” also known as genetically modified organisms (GMOs) or bioengineered foods, are those whose DNA makeup has been changed in a laboratory setting, in order to introduce desirable characteristics in the new product. Such characteristics may include taste, color, disease resistance, drought resistance and shortened growth time, among many others. 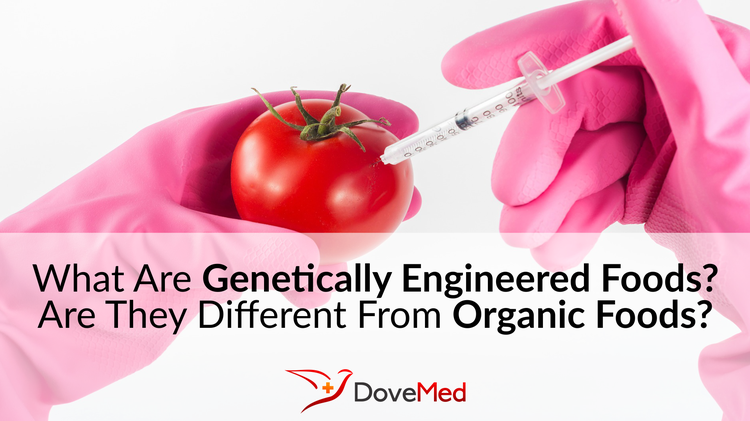 The combination of traits in genetically engineered foods is not present in nature, and cannot be achieved through conventional methods of selective crossbreeding. Are Genetically Engineered Foods Safe? Organic foods are derived from farms that do not use man-made fertilizers, pesticides, growth enhancers or regulators (which may include hormones and antibiotics), synthetic food additives (such as vitamins or minerals) to livestock feed, and industrial solvents or radiation (for product treatment). The methods used must comply with the regulations in one’s country, but generally are deemed more eco-friendly and biodiversity-oriented. If a processed food item is labeled “organic,” it should only contain organic ingredients. Are Genetically Modified Foods Different From Organic Foods? Per United States Department of Agriculture (USDA), the use of GMOs is prohibited in organic foods farming. Thus, organic farmers are unable to use GMO seeds for their crops, or GMO feed for their animals. So, essentially, organic foods, be it plant or animal based, are non-GMO. Therefore, if one has concerns about GMO foods in the market, checking for non-GMO labels, or, consuming organic foods may allay their worries. The final choice of food consumption may ultimately be dictated by one’s beliefs, comfort level with use of GMO products and cost. Nicolia, A., Manzo, A., Veronesi, F., & Rosellini, D. (2014). An overview of the last 10 years of genetically engineered crop safety research. Critical reviews in biotechnology, 34(1), 77-88. Bawa, A. S., & Anilakumar, K. R. (2013). Genetically modified foods: safety, risks and public concerns—a review. Journal of food science and technology, 50(6), 1035-1046. Barrows, G., Sexton, S., & Zilberman, D. (2014). Agricultural biotechnology: the promise and prospects of genetically modified crops. Journal of Economic Perspectives, 28(1), 99-120. Smith, M. D., Asche, F., Guttormsen, A. G., & Wiener, J. B. (2010). Genetically modified salmon and full impact assessment. Science, 330(6007), 1052-1053. Klümper, W., & Qaim, M. (2014). A meta-analysis of the impacts of genetically modified crops. PloS one, 9(11), e111629. Bøhn, T., Cuhra, M., Traavik, T., Sanden, M., Fagan, J., & Primicerio, R. (2014). Compositional differences in soybeans on the market: glyphosate accumulates in Roundup Ready GM soybeans. Food chemistry, 153, 207-215. Gebhard, F., & Smalla, K. (1999). Monitoring field releases of genetically modified sugar beets for persistence of transgenic plant DNA and horizontal gene transfer. FEMS Microbiology Ecology, 28(3), 261-272. Phillips, T. (2008). Genetically modified organisms (GMOs): Transgenic crops and recombinant DNA technology. Nature Education, 1(1), 213. Aris, A., & Leblanc, S. (2011). Maternal and fetal exposure to pesticides associated to genetically modified foods in Eastern Townships of Quebec, Canada. Reproductive Toxicology, 31(4), 528-533. Metcalfe, D. D., Astwood, J. D., Townsend, R., Sampson, H. A., Taylor, S. L., & Fuchs, R. L. (1996). Assessment of the allergenic potential of foods derived from genetically engineered crop plants. Critical Reviews in Food Science & Nutrition, 36(S1), 165-186. Goldstein, D. A., Tinland, B., Gilbertson, L. A., Staub, J. M., Bannon, G. A., Goodman, R. E., ... & Silvanovich, A. (2005). Human safety and genetically modified plants: a review of antibiotic resistance markers and future transformation selection technologies. Journal of Applied Microbiology, 99(1), 7-23.